Jason & Rick Sammon - I got to meet one of my biggest photography influences - thank you Kathy for the photoI was walking down the hallway in the Hilton Garden Inn looking to make a quick restroom stop before attending a photography seminar. I see a tall man at the end of the hallway who asks me, if I am looking for the photography seminar, that it is this way. I do not recognize him at first from a few feet away, but the voice was very familiar. As I get closer I realize it is the speaker for the seminar himself, Rick Sammon. 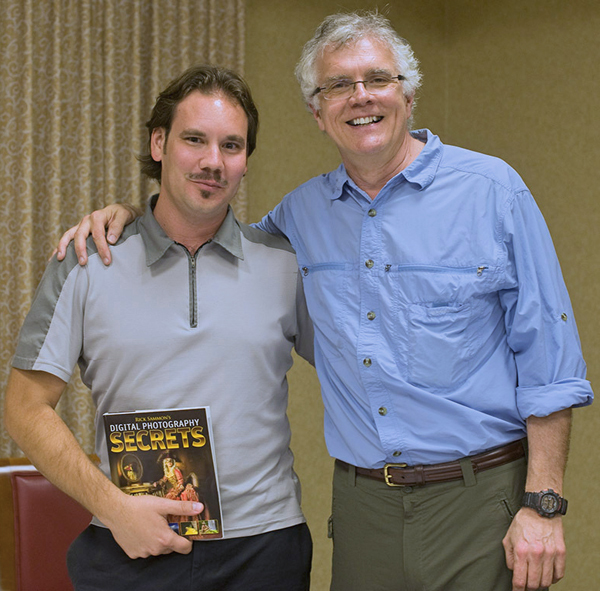 In my mind I thought wow, shook his hand and asked if he would sign my copy of his book, DIGITAL PHOTOGRAPHY SECRETS. He did so gladly. This is how I got to meet Rick Sammon for the first time after listening to him for years on photography podcasts, which made his voice very familiar to me. Rick (website) is a very famous photography traveling to dozens and dozens of countries making all kinds of photographs. His photography talent is evident in his images. What is perhaps even more amazing about him is his passion and enthusiasm for sharing what he knows and loves about photography with people, often for free. This particular evening he gave two hours of his time to talk to about a hundred local photographers of all levels. His photography podcasts I used to listen to were all for free. I really respect how much he gives to help others love photography as much as he does. About thirty minutes into Rick's photography seminar I began to realize just exactly how much my own photography knowledge came from him. Things I now tell my own photography students are nearly verbatim tips Rick espouses as key things for making great photographs. This surprised me and made me smile. I guess, however, this should hardly be surprising given I have listend to dozens of hours of his podcasts and read his SECRETS book containing all those tips. It was inspiring to meet Rick and feel his enthusiasm. This is my photography tip for your, go and hear (famous) professional photographers speak! I am sure you will always learn something. This will help your photography a lot. Each tip you can pick up adds to your skill set. Picking up a few key skills from other photographers and lots of practice was how I taught myself DSLR photography. I cannot emphasize enough how important it was to me randomly picking up a key piece of photography knowledge here and there because of being around other photographers via seminars like this one and even more through photography meetups. Thank you very much to Kathy for organizing this seminar and for making the photo of me with Rick above and for giving so much of her own time to run The Tampa Bay Strobist & Photoshop Collective on Meetup.com. You should join her group! So now I have had direct contact with my two favorite photographers and biggest influences, this meeting with Rick Sammon and a few years ago Scott Bourne personally critiqued one of my photos on his website. Try and seek out and meet your own favorite photographers! It may be easier than you think.